And they’re important. Email marketing is a lucrative channel, and any technical, tactical, or strategic potholes you run into take money from the bottom line. 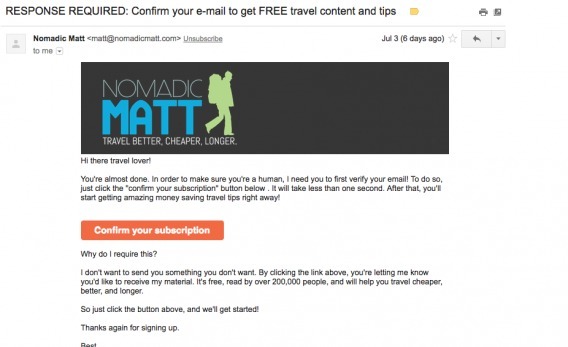 Let’s learn a bit more about email bounce rates – what they are, how to solve them, etc. An email bounce is quite simply an email that that is returned to the sender because it cannot be delivered, which could be a variety of reasons. In email marketing, a bounce occurs when the subscriber’s email server rejects your email. Of course, it’s generally a bad thing when your emails aren’t being delivered. Email delivery is one of those boring table stakes items, not unlike website performance to conversion rates. Basically, if your emails don’t reach your audience, everything else – persuasion, message match, analytics, and all of the other stuff we talk about in marketing – doesn’t matter. 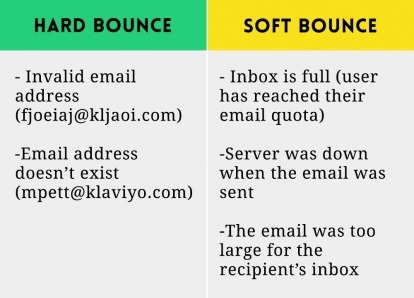 There are generally two types of email bounces. A hard bounce is when an email is permanently bounce back to the sender because the email address is invalid. This can occur when a person has moved companies and an email is now invalid, or simply when someone enters a junk email onto your form. A softt email bounce is recognized by the recipient’s server but is returned to sender, which could be for a few reasons. It could be that the recipient’s mailbox is full (unlikely nowadays), the recipient’s email server is down or offline, or the message is too large. Just remember that hard bounces are generally permanent, and soft bounces are generally temporary. What do you do in either case? In the case of a hard bounce, stop sending to that email address. Pretty simple. You can then do further research as to where the invalid emails are coming from and if you need to do further form validation. In the case of a soft bounce, you can retry several times as well as in the next campaign. If it still doesn’t deliver, stop sending to that person. The best way to reduce email bounce rate is to maintain good list hygiene. By that, I mean monitor your bounce rate, your opt-ins, and your key metrics, and clean things up regularly. That’s some advanced level stuff, but you can at the start make sure to purge your list regularly of invalid emails and non-responders. High bounce rates affect your sender reputation, so if you keep your list clean, you’ll have better delivery rates over the long term. Double opt-ins can add friction but in a good way in the end. You end up with less junk emails, and you increase the likelihood that people will be engaged email subscribers. Finally, monitor your email delivery. Essentially, keep a close eye on your bounce rates and other key metrics, like open rates, click through rates, etc. This way you can catch problems early and mitigate damage. There are some tools out there for monitoring inbox placement rates, whether you are getting blacklisted, and so on. You might want to check out 250ok, Return Path and YesMail, for example. They don’t come cheap, though. Email delivery is important. It’s table stakes for effective email marketing, so if your email bounce rate is crazy high, it’s the first thing you should look to fix. There could be a few reasons for high bounce rates, including bad sender reputation, poor software, low quality email opt-ins that allow junk emails to pass through, and more. Focus on removing hard bounces, monitor soft bounces, and think about cleansing your list of long term inactive subscribers as well.